APRIL/MAY POLL: WHEN DO YOU PURCHASE YOUR WATERMELON? - What About Watermelon? 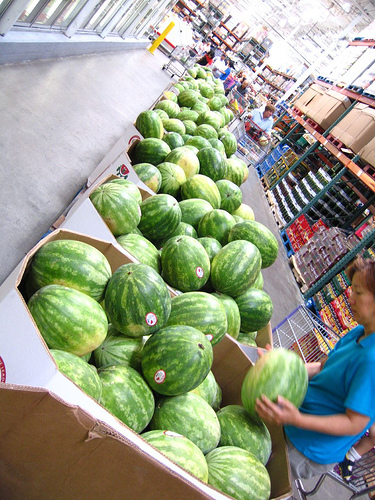 You are here: Home / General / APRIL/MAY POLL: WHEN DO YOU PURCHASE YOUR WATERMELON? APRIL/MAY POLL: WHEN DO YOU PURCHASE YOUR WATERMELON? As far back as I can remember, my mother would cut up watermelon to serve at backyard barbeques during the hot summer months. I’m telling you, there was nothing better than a cold slice of watermelon in July. Today, watermelon is enjoyed year round, but a lot of people still associate it with a spring/summer type of food. I’m not sure why. It tastes just as good on a cold winter day as it does on a warm spring day! And don’t even try to say you can’t find it in the grocery store in the winter. It’s there! Which leads me to our first ever poll question here on What About Watermelon: When do you purchase your watermelon? It’s a pretty straightforward question. Feel free to chime in with your answer on the poll in the right hand column and leave a comment on this entry! ASK THE EXPERTS: HOW LONG WILL MY WATERMELON LAST? I just wanted to add that it’s okay to be completely honest with this poll and with your comments on this question. A lot of people think watermelon is just a summer thing, but it’s really not! Granted, there’s just something about a summer day that makes watermelon taste a little better (it’s like ice cream that way), but there’s also some great things you can do with it in the winter. I look forward to sharing some of those tips with you all in the coming months and years here on What About Watermelon! I used to buy it in the summer only. And I still buy lots in the summer (takes up the whole fridge) but I just started to buy a bit in the winter too. Pound for pound it’s no more expensive than other fresh fruit options, but the crispness inside in the winter is pretty inconsistent. I wish I had a better method of determining flesh quality – plinking it with my fingers has not been a very good test. For answers to your fresh test conundrum, check out today’s post! Trust me if they were as good in the winter i would totally get them 365! Problem is that in the winter they are imported from central/south America and most of the farmers there apparently don’t know how to pick ripe watermelons! I occasionally get imported ones in the winter, but April-October i got HAM on domestic (and eventually local) watermelons! We got a watermelon today on this cold April day… the outside temp is 55 degree s to be exact!!. on the Eastcoast…never had a melon this early in the year. Thought we goce it a go and try one out . !! However, this super dark green big watermelon traveled from Mexico. ..
Will try it tonight ..though I’m just a bit curious! !